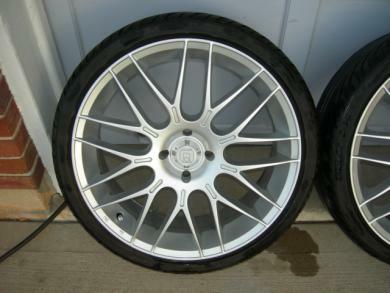 Here is a set of 18" (18x7) Motegi / Ro_Ja Neo 4.0 wheels. Rare and hard to find. Bolt pattern is 4 x 100, with approx. 40-42mm offset. Will fit most FWD cars no problem with this bolt pattern. Tires on these wheels are Falken FK451 Betas (Z-rated) 215/35 with approx. 1/3 tread left. These wheels were kept up very well, but there are a few minor scratches and dings from use. I had them on a Scion xB, but now I don't have the car anymore.